Hero MotoCorp has showcased Hero Destini 125 at Delhi Auto Expo 2018 with cosmetic upgrades and along with a brand new engine. It includes digital display with the analog instrument, i3s system and front disc brake option with IBS technology. 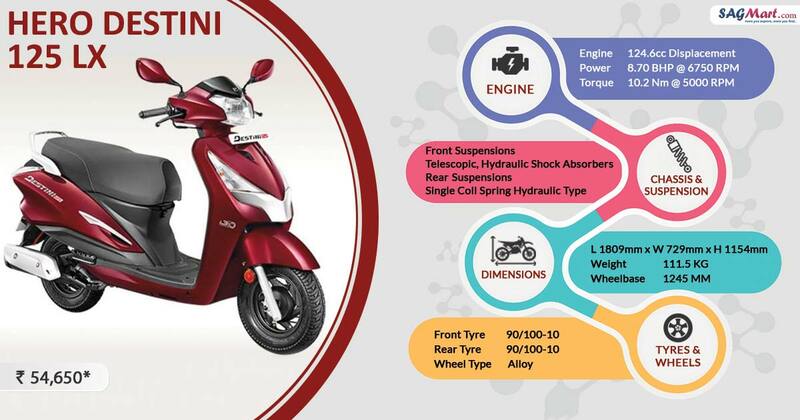 In terms of riding, the Destini 125 is quite good with every kind of road undulations, one can easily encounter such inconvenience. Designed to serve the family audience, the scooter is decent in terms of handling. If pushes limits, the scooter loses its composure which high-speed cornering. All in all, the scooter is not meant for people seeking for a performance ride. Whatever needed for a 125cc scooter with decent performance and excellent fuel economy, is provided by the automaker. It gets drum brakes units at both ends with the combi-braking system. The front disc is not even on offer as optional. The suspension setup comprises telescopic front forks and a single coil spring hydraulic unit at the rear mounted over the 10-inch wheels at both ends. At such an aggressive price tag of INR 57,500 (ex-showroom Delhi), the Hero Destini is the most affordable scooter available in the segment with all requirements for a family scooter. In terms of rivalry, it will undercut the models such as Suzuki Access 125, Honda Activa 125 and TVS Ntorq 125 in the segment.